LoopMail is safe, secure and never anonymous - everyone publishes in their real name. Because LoopMail is an internal messaging system, your email address is always hidden from other users. You may send LoopMail to other registered users on your School Loop site. Click on the LoopMail icon at the top of your Portal Page to view your Sent and Received email messages or send a new message. You can also view the Historical Archives of messages from previous years on the left-hand side of the page. Click the New Message button from inside LoopMail. Choose the group to which your recipient belongs from the Select a List box on the right side of the page. Check the box next to their name. You may choose multiple recipients. You can also begin typing the name of the person you want to send the message to in the To: field. The autofill feature will bring up names you can choose from. Note: Parents are only able to email their own students, and vice-versa. Parents can email their students by using the Email Learning Management Team link. See the Contacting Teachers help page for more info. For parents and students, the maximum number of recipients for the To and CC fields combined is 50. 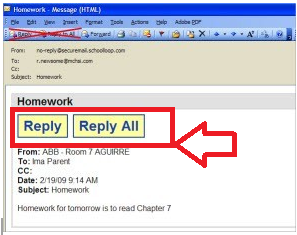 To reply to a LoopMail message from your email account, you must click the large Reply or Reply All buttons in the message itself. Alternately, you may log into your School Loop account and click the LoopMail icon at the top of your portal page. To reply, click a message title to open it and then click the Reply button at the top center of the page. When a recipient reads your email, a green check mark will appear next to the user's name on the message in your sent box. Note: The green check mark will only appear if the receiver has opened the message from inside their LoopMail account or replied to it from either their registered email account or LoopMail. Messages viewed only in the registered email account will not display the green check mark. If you are writing a LoopMail and leave the page, or get timed out, you will be redirected to where you left off when you return to LoopMail.